This recombinant enzyme is expressed in Pichia pastoris, and undergoes extensive purification to yield the highest quality product. Recombinant broad-spectrum non-specific protease derived from Tritirachium album and over-expressed in Pichia pastoris. High activity and exceptional purity (Molecular Biology Grade & NGS Grade). Active at high temperatures (up to 56°C) and denaturing conditions (e.g. in the presence of urea and/or SDS), what makes it ideal for digesting proteins in variety of applications. Stable over a wide pH range: 4.0–12.5 (optimum pH 7.5–8.0). Decreased amount of host DNA (≤ 10 pg/mg / MBG or ≤ 0.1 pg/mg NGS). Available as powder, lyophilized “cake” or liquid. Extraction of DNA and RNA from different starting materials. Purification of target material from contaminating proteins. Removal of DNases and RNases during nucleic acids isolation. One unit of Proteinase K hydrolyzes urea-denaturated hemoglobin producing color equivalent of 1 μmol tyrosine per 1 min at 37°C and pH 7.5 (Folin & Ciocalteu’s method), 1 U = 1 mAnsonU. 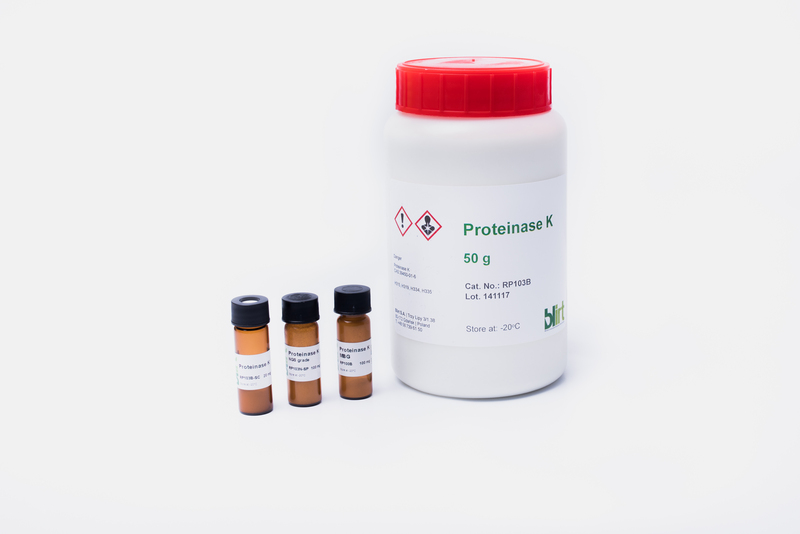 ≥ 70% Protein content is determined by measuring absorbance at 280 nm.